A coconut half with plastic chain shorties and wooden maple leafs - so sweet. 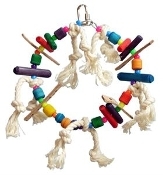 8.5" This toy may be used as a swing for a small bird or foraging bowl for a larger bird. A Feathered Addictions original design. ?